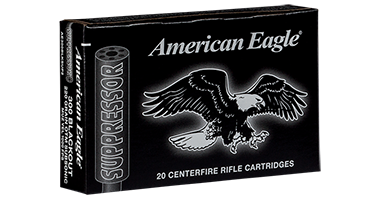 American Eagle® Rifle Suppressor rounds perform to their ballistic peak in suppressed firearms, thanks to carefully selected propellants, bullet weights and primers. Their sub-sonic loading eliminates the super-sonic “crack” suppressors can’t silence. In addition, special clean-burning powders minimize fouling while reliably functioning in semi-automatic firearms. Suppressor loads are priced for volume shooting.